These cute little striped Pacifier Clips are our newest binky clips with a plastic clip is the cutest accessory your little one needs! No need for anymore lost or dirty pacifiers or dropped small toys - simply use these to clip your baby's pacifier or small toy onto clothing, car seats, strollers, slings, blankets, bibs, etc! Made with 100% designer cotton fabric. These clips are plain and do not include personalization. This listing is for ONE of the above pacifier clips. 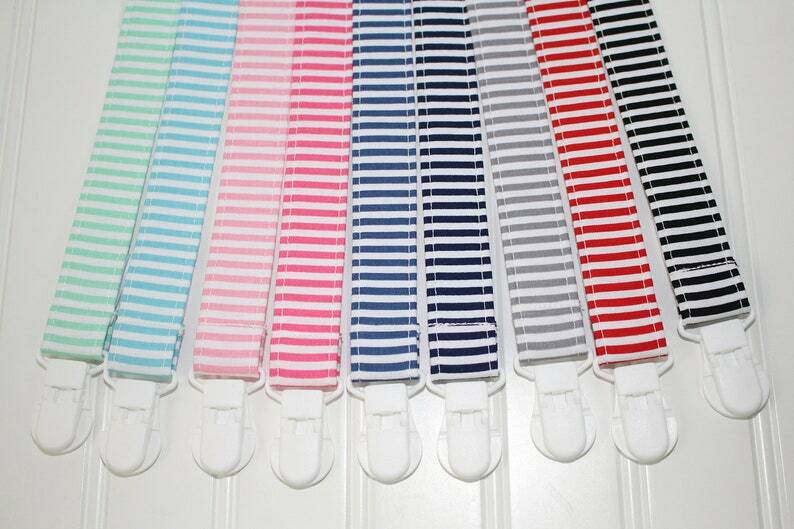 Just choose which color you would like from a very cute striped assortment from Riley Blake Striped Fabrics. For convenience to our customers, we now offer a silicone button adaptor to fit button style pacifiers. These colorful clips will hold up to the countless washings it's going to receive. Each clip strap is approximately 9” X 1” (not including the clip or loop). Our clips are made using 3 layers of fabric and lined with interfacing to help maintain shape and making them much more durable than only 2 layers of fabric. The clip is made of plastic to help protect baby's clothing but still provide a tight hold, and the loop allows this clip to be universally used with any pacifier or small toy. Infantly Cute Boutique label is attached to all our items. Please remember to never leave baby unattended with this clip. This product does contain small parts. It is not advised to put a sleeping child to bed with a clip attached to them. Infantly Cute Boutique products are made with the highest quality of materials. Fabric placement may vary. We take pride in the careful attention to detail we put into every item. Made in a smoke free - pet free studio.